Giovanni Pietro Caspani, this great Italian maker worked in Venice from 1650 until 1670. That makes this instrument at least three hundred and thirty years of age. Yet the condition was such, that it might have been made within the last century. Caspani learned his considerable art from working in his early days with the Amati brothers in Cremona. This is a flat backed viol shaped bass with a very beautiful carved scroll, that might or might not be original, but with an instrument such as this really does not matter, it is still within keeping. The varnish is a very fine quality oil based yellowish brown. All in all, a World class instrument by a World class maker. Sadly the photograph was taken just before the instrument was bought from Bernie Cash here pictured. It was bought by Gallery Strings, then sold on to a fine orchestral member of the Detroit Symphony Orchestra in the U.S.A.
Dear Bernie Cash. A great friend who I miss so very much. Bernie was a fine old school player, one who had the fine ability to cross from classical to jazz at the drop of a hat, or a telephone call from the Royal Philharmonic Orchestra or his friend and mine Peter Ind at the "Bass Clef". Sadly for all of us, Bernie died very suddenly some years ago while on tour with the Royal Philharmonic Orchestra in Germany. Bernie had several very good instruments including the above Caspani which he bought some years ago . He also bought a Louis Lawendahl double-bass from Gallery Strings. A very early Dresdon Lawendahl of c1780. 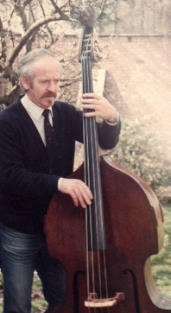 He also owned one of the best examples of John Lott double-basses that I have ever seen, sadly not bought from us. He was a prince among us and will be remembered by one and all who knew him.